Wexler Packaging Products, Inc. enjoyed another outstanding show at GRAPH EXPO 14’. The show was held at Chicago’s McCormick Place from September 28 – October 1, 2014. 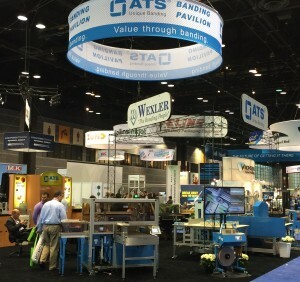 GRAPH EXPO 14’ was a success for the ATS Banding Pavilion, which served as the epicenter for banding solutions during the expo. “We saw a great deal of increased attendee interest in automation projects,” noted President Pattie Wexler. The ATS US-2000LBMMS-V-RF-P was a big hit on the show floor. Booth attendees loved the fact that this machine could take full lifts of product directly off of the cutter. Show trends this year included an increase with digital print in packaging. Continued integration of printing in packaging and finishing processes has opened up what may prove to be a permanent place for print in the manufacturing process. There was also a large trend in customers lowering overall costs.  This worked out great for Wexler considering that two of the key benefits of banding include material and labor savings. GRAPH EXPO 14’ brought increased profit opportunities for the package printing industry thanks to the co-location of CPP, the innovative converting and package printing tradeshow. The show brought together both experts and niche submarkets print packaging, proving GRAPH EXPO 14’ to be a worthwhile event filled with viable business opportunities.